Welcome to the latest instalment of Styled Three Ways, a regular post around these parts where I take one piece of new season clothing and style it several ways. The reason for these posts is pretty simple. Most of us are working within a budget and/or have limited wardrobe space, so we’re looking for versatile pieces that can work across a variety of scenarios. 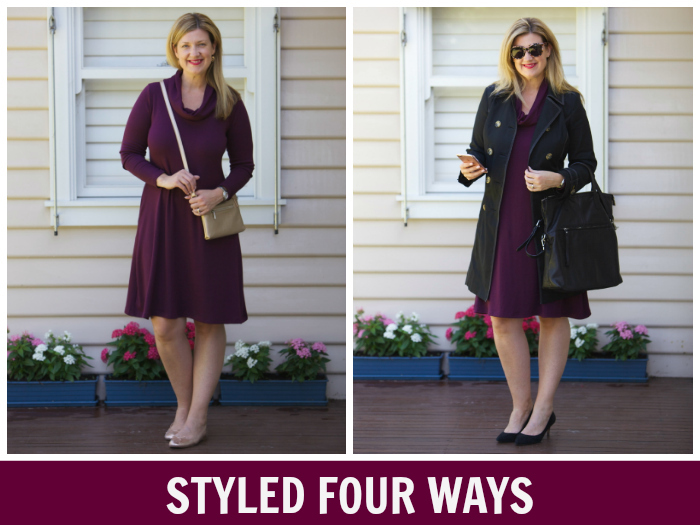 And now that Autumn has arrived, I wanted to feature a fabulous trans-seasonal piece – hello Bird Keepers’ Cowl Neck Jersey Dress, $99.95 from Birdsnest – but instead of styling it the usual three ways, I’ve styled it FOUR ways. So why did I choose this piece? 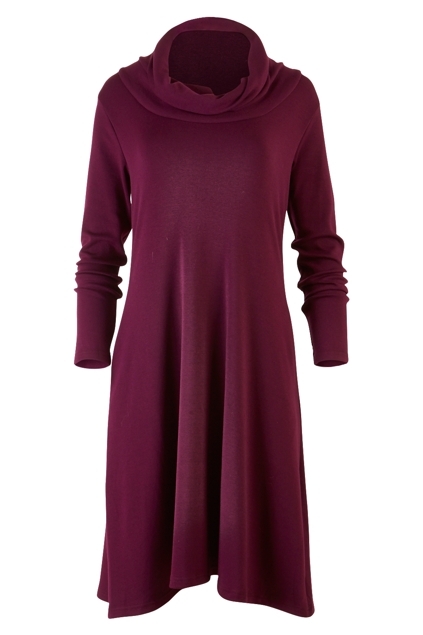 To begin with, I reckon this lovely dress is a great trans-seasonal winner, with it’s long sleeves and medium weight jersey fabrication – 68% cotton 27% polyester 5% spandex if you want to get technical. It’s medium weight not only makes it ideal for cool nights now but also cool days and nights well into Winter. The spandex also makes it easy and comfortable to wear as it has plenty of give. Then there are the details – the relaxed cowl neck which creates interest and elevates this from a simple jersey dress to something more special as well as the pockets in the side seams that make this a practical option, not just a pretty one. In terms of shape, it’s relaxed a-line shape means it skims in all the right places but also manages to create a flattering silhouette. LOVING that. 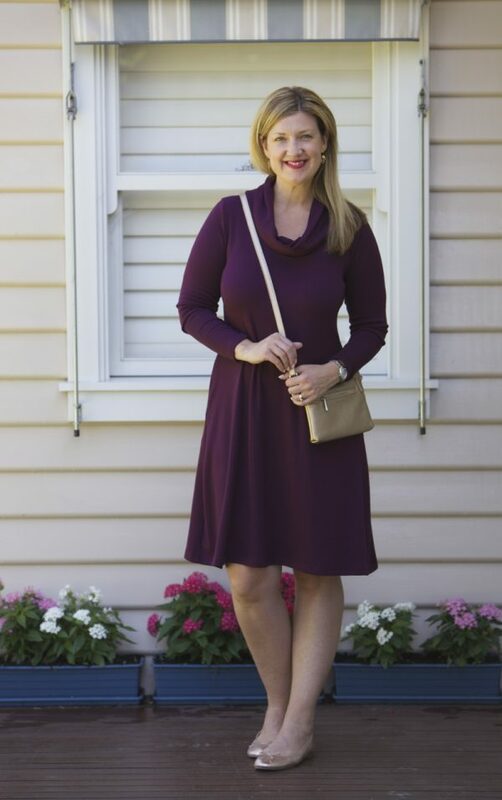 Finally, while this dress does come in super practical and classic black (check it out here), I’ve opted for the on trend plum to add something different to my Autumn/Winter wardrobe. I love this warm, dark pink hue and, as you’ll see below, it’s easy to style and works beautifully with metallic options, black and my favourite other “neutral”, leopard print. I haven’t bought a single thing to style this dress with too – it slots into my existing wardrobe perfectly. Then there’s the all important small print. This dress is designed and made in Australia and you can either gently hand wash it in cold water or pop in the machine. I’d use a gentle cycle. If you want to try before you buy, you can also sign up for a Birdsnest Changeroom Experience – more details on that here. Finally, I reckon this dress is a deadset wardrobe winner. It works across a variety of scenarios and easily justifies it’s wardrobe real estate, particularly for those of us who are looking for pieces that can be work across work, on weekends and dressier do’s. The first outfit is a smart casual look, perfect for appointments, lunch with the girls or a family birthday party. All I’ve added is simple rose gold ballet flats and accessories. The pink tones of the rose gold work beautifully with the plum. Above, I’m wearing Bird Keepers’ Cowl Neck Jersey Dress with Wittner ballet flats (last AW); Louen Hide bag (same style available in different colours here) and rose gold earrings from Nicole Fendel Jewellery (now sold out). The next look is a dressier look – date night or perhaps dinner with the girls. 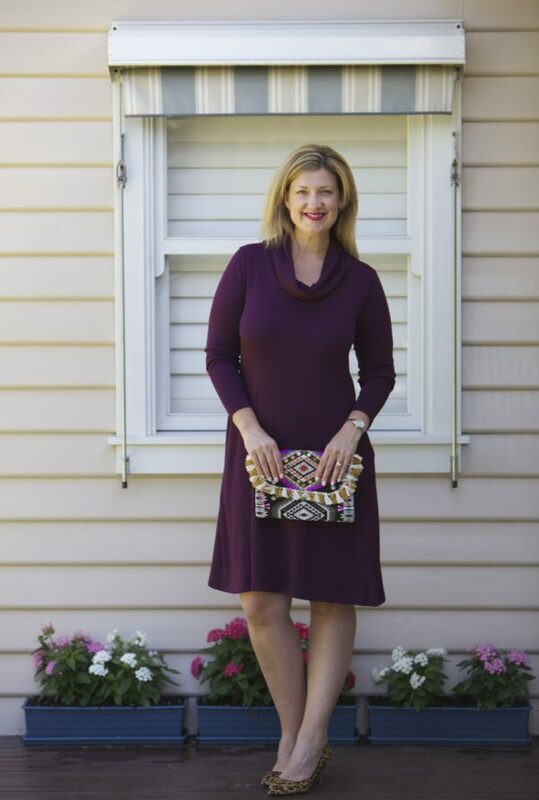 Above, I’m wearing Bird Keepers’ Cowl Neck Jersey Dress with Kate Spade earrings (picked up in the U.S a couple of years ago) with leopard print heels from Mimco (for a similar style try these) and a clutch from Dotti. For this next outfit, I’ve put together an outfit that I’d wear to work. By adding some classic black accessories and a trench coat, you’ve got a great outfit for work. Above, I’m wearing Bird Keepers’ Cowl Neck Jersey Dress with a trench coat from Boden, suede heels from Country Road and a Trenery bag, all from previous seasons. For this final outfit, I’m thinking a party, engagement do or some other special occasion. I’ve added some bling and some pretty heels and, of course, a nice bright lip (Girl About Town by MAC). Above, I’m wearing Bird Keepers’ Cowl Neck Jersey Dress with Peter Lang earrings (similar styles here) and heels from Nine West (same style in different colours here). I’m wearing a size 12 and I’ve got plenty of room so I’d say it’s on the generous end of true to size. I’m 5’9″ or 175cm and this dress hits just above my knee – the perfect length for me. In addition to those outfits above, I’d also wear this fab frock with black opaque stockings and black heeled ankle boots in Winter. A long line cardy, gillet or woollen coat in black or charcoal would work here too. I’d also wear it with leggings and ballet flats. If you like to draw the eye to the waist, you could also add a belt. 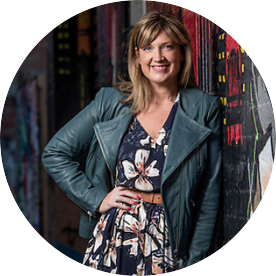 * Big thanks to Birdsnest for gifting me this frock so I could feature in this post. Are you on board the plum train? Which of the above looks is your fave?